"It just isn't conceivable that you can design a program strong enough to beat players like me." Here's the April-2017 list after two major replays due to an unsatisfying attempt to reduce time control to 900+2. I simply disliked mixing two TC's. Besides, seeing Komodo ranked lower than expected made me think i should rather go back to 900+1. Yes, i did this in weeks but the big surprise was that the lizard couldn't do better. Anyways, it's Komodo 10.3 itself to blame possibly for a bad build. As i stated before, i'll miss Komodo 10.2 that reached 3390 ELO, close enough to SF8. Shame, that one is gone already. Nevertheless, i guess this release is the best Rapidroid ever, given that all 11 divisions contained 10 engines each without variations in number of games played. If you see some differences in the list, it's because of the manual games added at the final step. I've tried to improve the calibration system as well. Now the arm build architecture is taken into account too. And last but not least, all previous games played on Rockchip 3188 processor have been updated on Exynos 4412. Rapidroid is based on Exynos 4412 and Rockchip 3066 only now. I hope to respect the restrictions of this test environment in future releases. Shortly said: all updates replace previous games and all impacted divisions are partly replayed in respect to 3 promotions and 3 relegations per division. This system is very demanding in terms of duration but the outcome looks accurate. 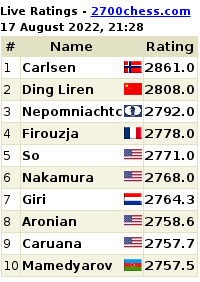 Regarding the ranking, numbers are speaking: Stockfish 8 is decisively the leader ahead of disappointing Komodo 10.3 while Chiron 4 is a nice surprise surpassing the old Critter at last! Multicore Ivanhoe is also welcome with a significant boost. Good job Gurcan! Big disappointment by K 10.3, but very nice performance by Chiron! Thanks. Stockfish 8.0.AP, pgo or normal arm7? Yes indeed. 4 threads with 256MB hash have finally come together in one build. Our friend Javier has released new app, Chess Engines Tournament in Google Play Store.